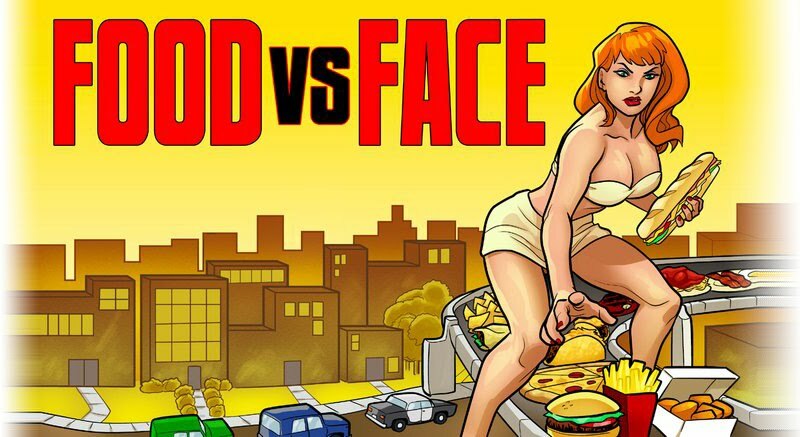 Food vs. Face: Dot's Market - It's what's for dinner! I know I go on and on about my beloved Dot's Market for their butcher shop, but there's another reason to love it even more that I've never thought of mentioning. By Wednesday night, we were fresh out of groceries and saw no reason to buy more since we were heading to HeroesCon in Charlotte over the weekend. Didn't feel much like going out to dinner either, because we'd be eating in restaurants for the next several days. Well, that sounds like a perfectly good excuse to get broasted chicken from Dot's. We went in and pulled a number, but they normally let you cut in line if you stand by the chicken, because your order won't take long. We got two of their dinner specials, which includes three pieces of chicken (breast, wing and thigh or breast, leg and thigh), cole slaw, a King's Hawaiian roll and three big potato wedges. Remember back when I mentioned Old Hickory (on N. Main) had changed their broasted potatoes by ordering them already wedged and coated, and that they were one of my new favorite indulgences? Well, Dot's has the same potatoes now. The chicken is tops. Broasted has always been my favorite (aside from Ma FvF's fried chicken), and it's not easy to come by now that Chicken Louie's is "temporarily" closed. The breading is crispy and perfectly seasoned, and it's never greasy. Considering this is leaps and bounds better than the mass-produced, greasy mess you can get from KFC, Lee's, etc - you'd probably expect to pay a fine price for that kind of quality. Not at Dot's you won't. $4.49 for a 3 piece meal, two sides and a roll. 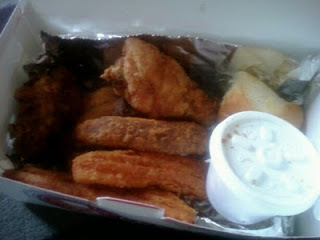 Of course, you can also get Dot's chicken by the truckload (call ahead, too!) for things like picnics, family reunions and the like. So, the next time you're not up for cooking dinner, or you need to feed an entire football team, remember that there's more than just KFC. And don't forget about the Bull Pen, the restaurant inside Dot's. Yes, that's how awesome this little mom & pop grocer is. They have their own little greasy spoon right around the corner from the beer cooler, serving up gems like the often-craved meatloaf they sell in the butcher shop, country fried steaks, and pork chops. Need less to say, this gets 5 out of 5 sporks!